Have you ever wanted to enjoy some shade at the beach without fighting over umbrella space with your family members? Do you want to go to the beach but worry about giving your baby or toddler a shady place to rest? Have you ever heard of half tents for beach use? Last update on 2019-04-25 at 19:18 Product prices and availability are accurate as of the date/time indicated and are subject to change. Any price and availability information displayed on [relevant Amazon Site(s), as applicable] at the time of purchase will apply to the purchase of this product. If you’ve never seen a half-tent, you’re in luck. In this article, we’ll show you five of the best half-tents for use on the beach available on the market today. You’ll be able to compare the quality of each one and find the one that will work best for your family. But why would you want a product like this anyway? Can’t you just sit on the beach normally? In short, it’s great to have a half-tent because it provides you with plenty of UV protection from the sun and even a quick place to duck when a sudden afternoon rain shower crops up, too. There are a lot of other great reasons to have a half-tent ready for your next trip to the beach, but for the most part, they’re ideal for giving your family your own little private shady spot. And when you’re going to the beach with kids, this is especially important! To find the right beach half-tent for your needs, read on! Choose the GigaTent Sand Castle Beach Cabana for a low-cost way to keep cool and shady on the beach. This tent features a closing front door that can be zippered shut for protection if a sudden shower approaches. When unzipped, the door becomes extra floor space for spreading out comfortably. 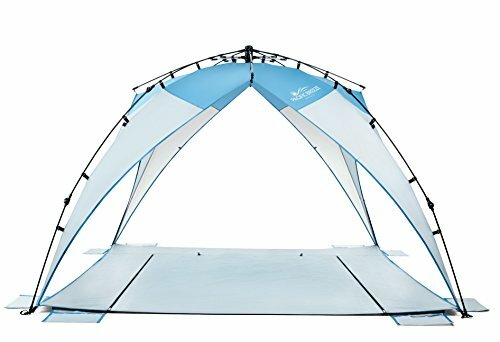 This is a great budget tent for infrequent beach use. The tent is very lightweight and easy to put together and take down. The tent may arrive with some damage in rare instances. When used in direct sunlight for a long period of time, the tent may become damaged. The incredibly lightweight SolarWave Outdoor Easy-Up Pop-Up Beach Sun Tent is the best option for anyone looking for a tent that will pop up on its own and weigh next to nothing for transportation purposes. 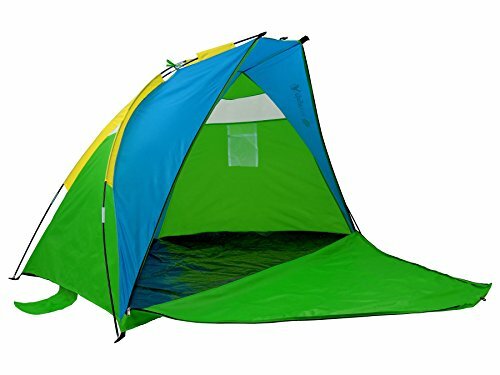 This tent is large enough for a couple of adults or a few kids to enjoy comfortably, and it includes two mesh windows for a great cross breeze. The tent is easy to weigh down with the included sandbag pouches on the sides. The tent comes with stakes so you can secure it more easily. The tent is very hard to fold back down after you’re finished with it. There is no floor on this tent, so it may not be ideal for use with babies. When you’re looking for a simple but truly effective tent, look no further than the FiveJoy Instant Pop-Up Cabana Beach Tent. This product can be popped up in just a couple of minutes by simply taking it out of its included carrying bag, then folded down just as easily when the day is done. The tent includes mesh windows on both sides to create plenty of airflow and keep everyone inside cool and comfortable. 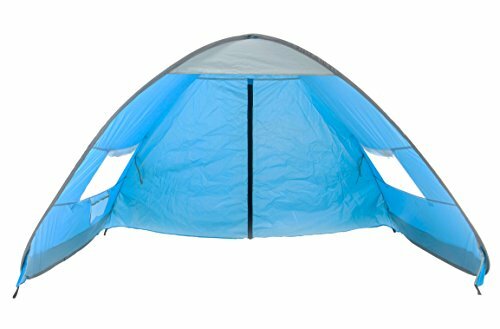 This tent comes in three fun colors to choose from. This is a lightweight tent that doesn’t take up too much room in your vehicle on the way to the beach. The tent doesn’t stay in place very well with the included stakes and may need better-quality stakes to work properly. The included carrying bag may become damaged easily. 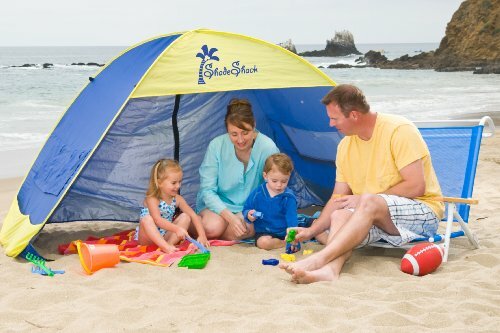 Spend all day at the beach in comfort with the Shade Shack Instant Pop Up Family Beach Tent and Sun Shelter. This tent is one of the best-selling half-tents on the market today, and it’s easy to set up and take down in just a few short minutes. Bring it along with your family for a quick shelter you can all enjoy together. 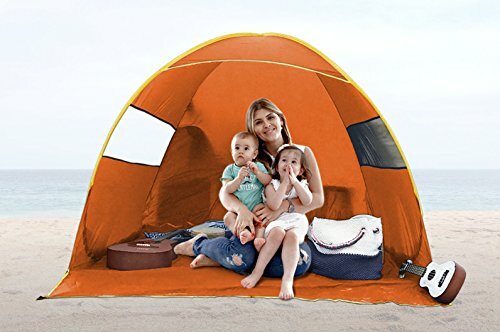 This tent offers three complete walls to provide more protection from the sun and wind, which is especially nice with little ones along for the trip. The tent is available in two different color combinations. You may need some help taking this tent down, especially the first time y ou try it. The tent may collapse in very strong winds. The Pacific Breeze Sand & Surf Beach Shelter is a high-quality, spacious half-tent that’s just ready and waiting for you to discover its potential. Made of UPF 50+ fabric, this tent is sure to keep you protected from the harsh rays of the sun while providing you a breathable, airy experience thanks to all the large built-in windows. This tent comes with built-in sandbag pouches to weigh it down easily and quickly. There is plenty of room inside this tent for a couple of adults and a child. This tent is a lot more expensive than most of the others listed here and may be over-budget for some buyers. The tent may blow over in very strong winds or if a storm should come up. Did you find a half-tent for your next beach excursion? As you can see, these are popular products that can go a long way toward helping you enjoy a safe and exciting time at the beach (or when you go camping, too!). But it’s important to make sure you’re keeping up with regular maintenance of your tent to keep it looking and working great for as long as possible. Remember to always clean your tent at least once per season—or more, if you’re able to do so. For a quick clean, you can rinse it off with a garden hose and let it air-dry in indirect sunlight. For a deeper clean, mix mild dish soap (not detergent) with water and scrub it with a soft sponge, then rinse it off with your garden hose and let it air-dry as normal. Don’t let your tent air-dry in direct sunlight, or you may risk making the fabric brittle and more easily damaged. And when it comes time to store your tent, be sure you put it in any storage bag it might have come with and keep it out of the direct sunlight. Storing it in your garage or attic is perfect. With the right maintenance, your half-tent will be with you for several summers to come!